I'd say that's a pretty nice problem to have, keep it up! I notice that the 2.1 Titans version is a lot smaller in size than the previous version (144.7 mb compared to 500+ mb in the previous version). I just want to make sure that's intended before I upgrade considering the large difference in file size. Yeah that's the correct size for the archive. Cool deal. Just wanted to make sure everything was on the up and up. Big thanks for the work you put into your projects. They make the game a LOT more fun to play. Appreciate the collection. Totally an essential mod for AA2. Just curious though, have you seen anymore clothes for the Guys? No homo but I do hope there would be more clothes for the males since they lack so much variety. Anyway keep up the good work! I'm hoping someone manages to make a Sailor Moon style sailor scout outfit eventually (though I do imagine that would be a tough one to pull off). AG3 got it, so maybe AA2 will get something like it eventually too. Only need to take it from AG3 and fit it with the AA2 models. I just finished installing the game but I also ran into some problems. Though I have 3 tabs of clothes for me to choose from, none of these clothes would show as their icons suggest. I have the images here to show. Step 1: Install the base game. First the Character Editor, then the game itself. Step 2: Install the Artificial Academy 2 DLC HF Patch released on the forum. Step 3: Install the Artificial Academy 2 HF Patch. So does anyone know the fix to this problem. 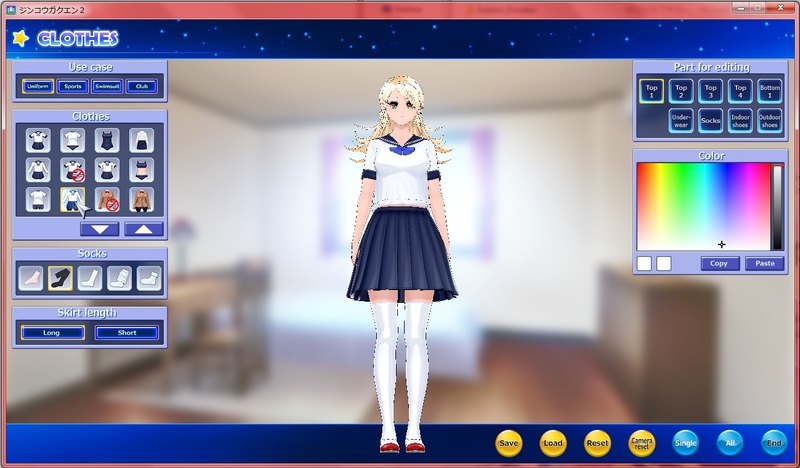 I've been removing and installing the game for hours and I still can get the clothes to work properly. Am I missing anything critical here? Please help!! I always run my game with AppLocale. The game seems to run smoothly and the text and showing correctly. However I still wish to have some of my characters' names displaying in Japanese but the names would show up as random codes in game. You forgot about installing the Append Sets. I had the same issue and installing Append Sets helped. Thank you good sir. The append sets are the two DLCs that were released after the base game correct? I'll look around on the forum to find their download links. So I'll have have to install the two DLCs after the base game then the rest stays the same? @thelulz: This essential mod is brilliant! I admire your continued revision of how to put it together in the best way. In the later versions you elegantly circumvented the IW uninstall limitation by not including .pp files but instead create them and as a bonus the size went down several hundred MB's. Great job!! HEXACC v2.2 is out. Enjoy. Thank you thelulz for the mod and keeping it updated! Really thank you very much!! Out of curiosity, do you think it would be fine to install the newest version over the old one via IW, or should I always uninstall the old one, first? I'd be going from v2.1 to 2.2, btw.